Our extensive range of inflatable kayaks & canoes includes a variety of models suitable for tandem & 2 person use such as the Gumotex Twist 2, Swing 2 & Palava as we all as the Sevylor Madison & Waterton. We also offer a number of 2+1 inflatable kayaks and canoes designed to carry 2 adults & a child in a smaller centre seat - ideal for family fun! The centre seats on these models can be left out making them a spacious tandem option. Models providing this capacity include the Gumotex Solar 3, Seawave & Scout as well as the Sevylor the Alameda & Ottawa. Gumotex Twist 2 2018 is compact & lightweight tandem inflatable kayak that weighs only 13kg. Offering great all round performance with a tiny pack size and quick to dry. Grab a bargain in our 2018 model clearance blowout deal! WHILST STOCKS LAST! The Gumotex Solar 3 2018 model can be configured to paddle as a solo, tandem or even 3 person inflatable thanks to its adjustable seat configuration. Grab a bargain in our 2018 model clearance blowout deal! WHILST STOCKS LAST! The Sevylor Madison is the successor to the now discontinued Colorado. It combines an extraordinary mix of manoeuvrability, stability and comfort. Can be configured as a solo or tandem. Constructed with a nylon outer shell and seperate internal bladders. Ideal for cruising on inland waterways or sheltered coastlines. Designed to carry up to 2 adults & 1 child the Sevylor Alameda offers performance, stability & comfort for all the family. Constructed with a nylon outer shell and seperate internal bladders. The latest Gumotex Solar 2019 is a high peformance spacious tandem inflatable kayak with optional 3rd seat for carrying an additional child. Like most of the Gumotex range the Solar is constructed from durable & quick drying Nitrilon. Using the latest drop stitch technology, the Thaya offers a high-pressure rigid hull design that boasts improved performance and increased comfort. Suitable for two paddlers but can be paddled solo. 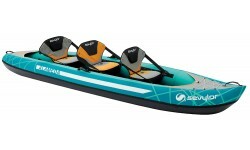 The Seawave is a hugely versatile and high performing sea & touring kayak capable of long distances & expeditions. Available with closed cockpit deck for 1 or 2 as well as optional rudder and 3rd seat. The Gumotex Palava has been styled and designed to be paddled as a canoe with single blade paddles. Wooden bench style seats allow the user to sit or kneel for tackling rapids and rougher water. An optional 3rd seat allows the Palava to carry up to 3 people. 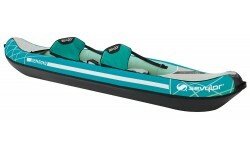 At 445cm in length the Gumotex Scout provides the space of a rigid open canoe with 3 seats & a 450kg weight capacity. However, unlike most open canoes its packs down to only 70 x 45 x 30cm and can be popped in the boot of the car. The ideal choice for families. 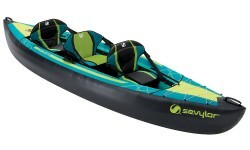 The Sevylor Waterton is a two person inflatable kayak that is lightweight, easy to carry and inflates in minutes to provide family fun at an excellent price. Designed for kayaking on sheltered water and rivers. 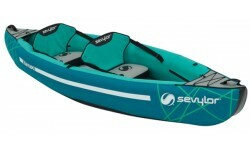 The Sevylor Adventure Plus is great family boat and can carry up to 2 adults and 1 child. The centre child seat can be removed in order to create more space. This is one of our most spacious model making it ideal for family adventures on the water. Designed and styled to look like a traditional open canoe.